The holidays offer important life lessons, especially for my children. 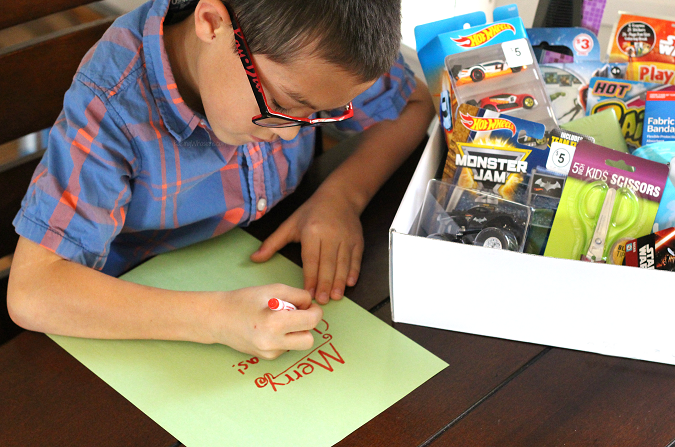 I’m teaching our kids to give back during the holidays with a little help from Family Dollar. This post is sponsored by Family Dollar. All opinions are my own. It was just this week that I was sitting in the car with my 4-year-old as she exclaimed “I can’t wait for Christmas presents!” That’s when a harsh dose of reality hit me. Raising unselfish kids, the struggle is real. As much as I try to ingrain the foundations of giving back, loving others and being kind, sometimes those selfish child reflexes are harder to break. But that doesn’t mean we should give up. That just means we try even harder. Every year, my family makes a point to stop what we’re doing during the busy holiday season to teach our kids to give back during the holidays. This year, we’re starting early. 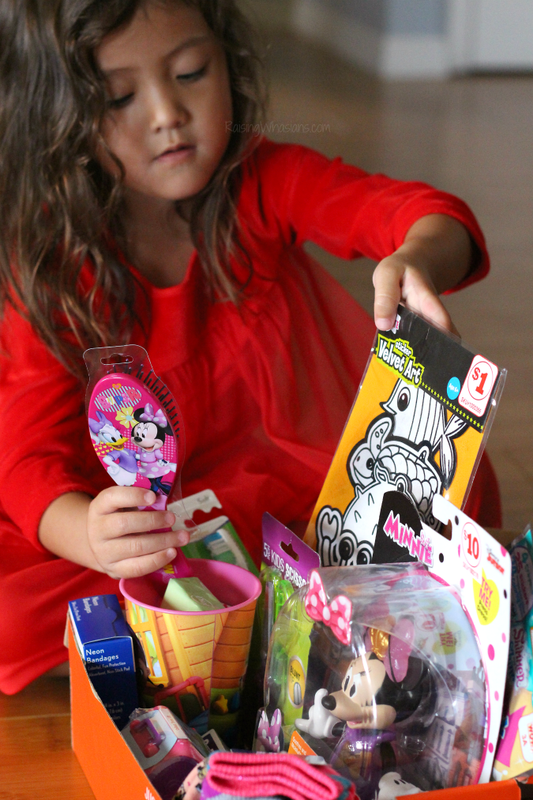 Find out how we’re teaching our kids the art of giving back this holiday season by “discovering something new” at Family Dollar. 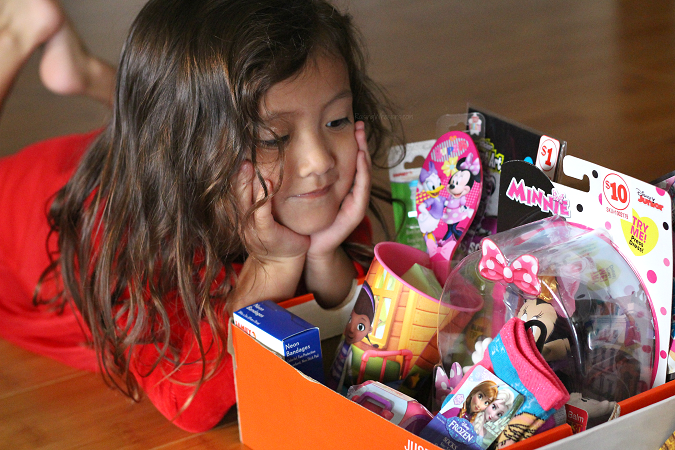 It all begins with a shoebox and a wish list. Filling shoeboxes for children that wouldn’t get Christmas presents this year was our family mission. Our giving project started with a little research as we wrote down things that needed to go in our shoeboxes to make Christmas magic happen for the kids in need. Particularly kids the same age as our kids: a 2-4-year-old girl for my daughter, and a 7-9-year-old boy for my son. 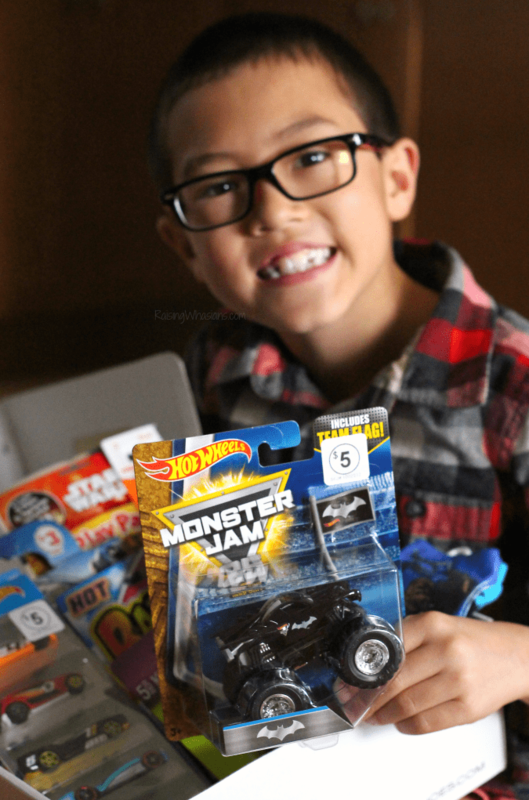 A “WOW” gift (aka a really special toy) was a priority on our lists as well as toiletries, school supplies, clothes and other little surprises for lasting holiday memories. 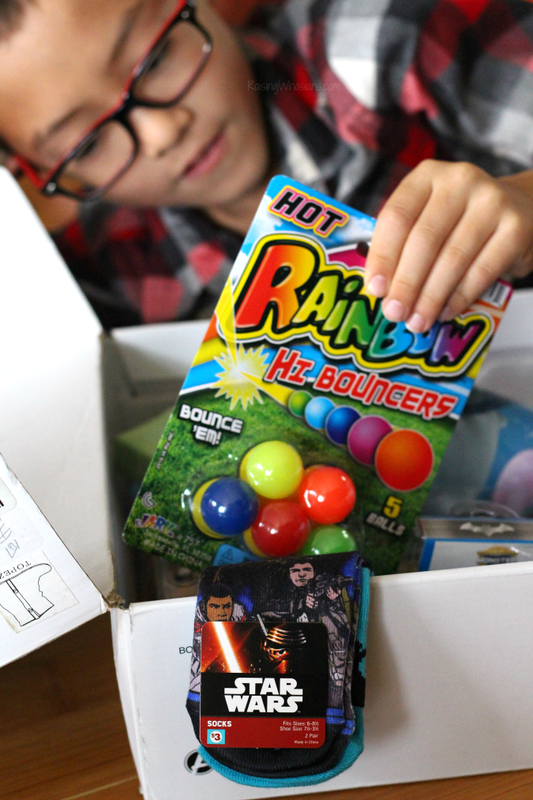 Where was I going to find all of the items on our shoebox list, including those “WOW” toys? Family Dollar. I let the kids take the lead with their shopping lists as we drove around the corner to our local Family Dollar store. Already stocked for the holidays, I love that Family Dollar has a wide variety of quality kids toys with lots of name-brand picks for under $25. I appreciated that Family Dollar has amazing kids toy choices that still fit within our family budget. I even spotted “potential” gifts for my own kids (maybe another trip). As we browsed the aisle, my kids loved picking out their own personal “WOW” gift for their child. My daughter grabbed this adorable Minnie doll and a little Puppy in My Pocket for a girl her age. My son stuck to his favorite Hot Wheels trucks and cars. But beyond just toys, Family Dollar made our shoebox shopping experience easy and unforgettable as my kids grabbed special items for each child: socks, bandages, toothbrushes, stickers, reusable cups and more to put in their shoeboxes. They were so proud to pick out each thoughtful gift! Family Dollar’s Everyday Low Prices, Price Drop and $1 WOW items helped us stretch our holiday dollars further as we filled each shoebox to the brim with great products. Both of my kids are very task-oriented. Sorting through all of our items we purchased from Family Dollar, I gave my kids the task of packing their own boxes. 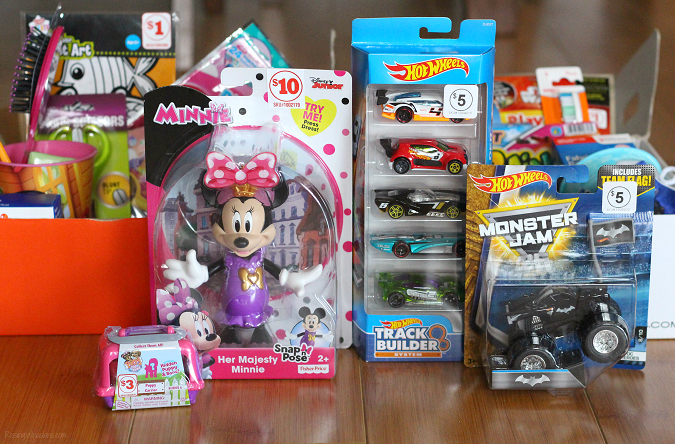 My kids were delighted to fill each box with the items that they picked out, each making sure that the WOW toys were clearly visible to the children who would receive them. I love how much their giving hearts grew as they lovingly and carefully packed all of their items. There’s something so special about giving from the heart, especially around the holidays. We finished our shoeboxes with personal notes from our family. Each with a little drawing and message from our kids, it was the perfect final touch to our giving project. Shoeboxes full and completed, my kids are learning how much more fulfilling it is to give this holiday season. Through this giving project, I truly believe that my kids’ giving hearts grew just a little bit bigger, laying those forever foundations for giving back. 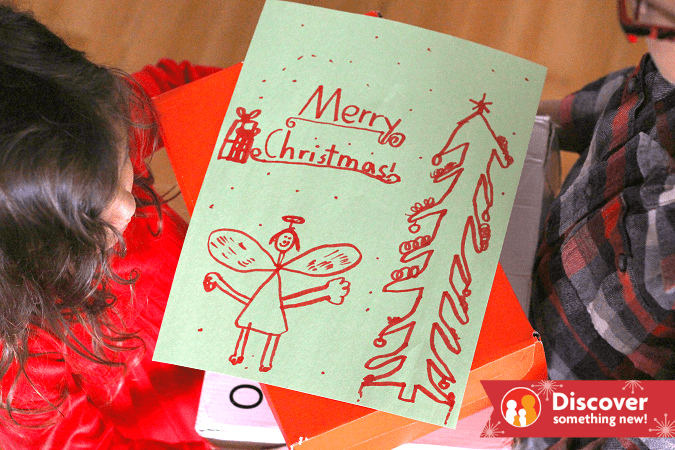 Giving back this Christmas is easy thanks to Family Dollar. We “discovered something new” in our store this holiday season – giving hearts! Our one-stop-shop for everything to pack in our shoeboxes, we loved finding the perfect name-brand toys for under $25, along with all of the school supplies, toiletries and more surprise goodies to make kids’ Christmases just a little brighter. I invite you and your family to Discover Something New at your local Family Dollar this holiday season. Need some inspiration? 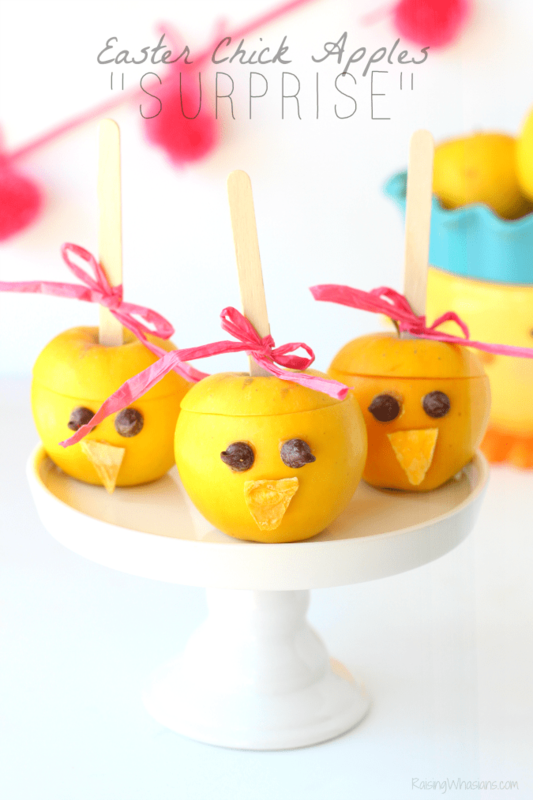 Check out what my friend Dawn over at Cutefetti recently discovered at her Family Dollar. And stay tuned for more fun inspiration from Mom Endeavors, The Penny Closet, Sprinkle Some Fun, and Lexi With The Curls coming soon. Raising unselfish kids – we’re still working on it. But I love how giving back this holiday season with Family Dollar has helped my kids discover how much giving hearts are happy hearts. How are you teaching your kids to give back during the holidays? Have you discovered something new at your Family Dollar? Be sure to follow Raising Whasians via Facebook, Twitter, Google, Instagram, Pinterest and YouTube for our family moments, recipes, crafts, travel and more. What a great example you’re showing your kids! Looks like they got a ton of great goodies to give! I love the Shoebox project. Our church does this every year. I think it’s a great way to teach kids about giving. Looks like Family Dollar has some great deals. What a sweet idea. It’s nice to see families focusing on giving instead of just getting at the holiday season. I absolutely ADORE what you’re doing with the kids! I think it’s so important to teach our kids to give back. Giving is always better than receiving. I’m loving those prices, too! What a lovely idea to help kids learn to give back I remember filling a shoe box with toys when I was younger, it always stayed with me. Who knew that the Dollar Tree had such amazing toys to give as gifts?! 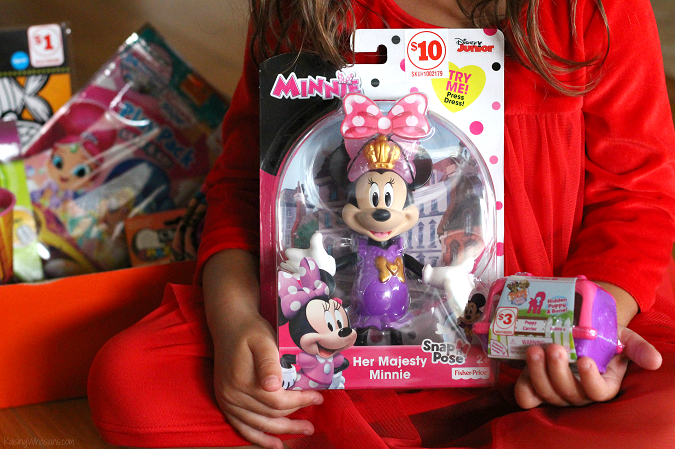 My eye is on that Minnie Mouse figurine – how darn cute! And yes, couldn’t agree more: teaching our kids about giving back is important… all year round! This was actually Family Dollar! We found some really great quality toys for our budget! It is important to give back to the community during the holidays and all year round. I think having our kids give back will help inspire them to give back in the future too, as adults! I love that you allowed your children to select the toys themselves, as well as include a handmade card. Those small touches add a special memory to the experience for sure! It’s so nice to be able to teach them compassion and kindness, especially since that’s what the world needs more of right now. I think it’s awesome that you’re sharing these ideas. Love this idea, it’s sooo important to teach kids about giving and this is a great way to do that. What a nice idea! We do something very similar at our church. In fact, the kids just made turkey crafts for the thanksgiving outreach bags! This is so fun and a great way to easily give back. We did this last year with our Girl Scout Troop it’s such a great way for kids to get busy with helping. The girls all loved it too! This is a great way to help teach our kids to give back. I love to shop at Family Dollar. They always have a great selection of everything you need for every holiday. What a great idea! We pack these boxes for kids every year, and my son is finally old enough to understand what we are doing. We will have to get to Family Dollar to get our gifts. 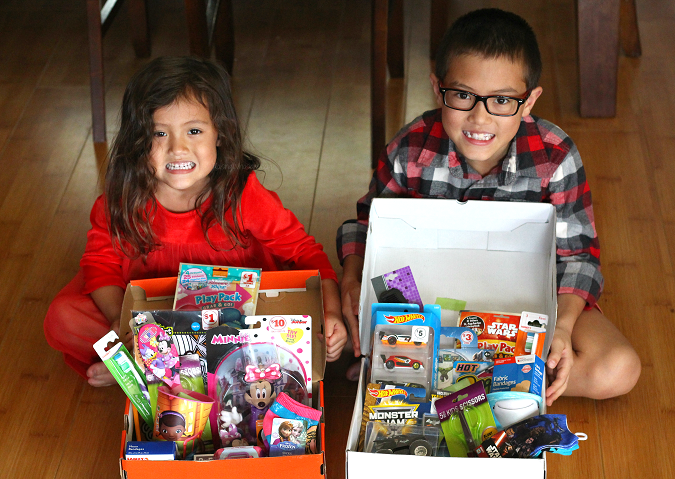 These shoebox gifts were full of fun surprises! What a wonderful way to teach the kids to give back. The “Merry Christmas” card was super sweet! Such a wonderful idea. It is great to teach our kids about thinking of others and helping them out. Yes I’m all about this! I always have my kids donate during the holiday time! We’ve made those shoe boxes before. The kids LOVED doing it and it warmed my heart to see their giving spirit. My girls each select a name from the Angel Tree to buy for every year. We’ll be sure to head to Family Dollar to make our holiday budget go a little further so maybe we can help another child or two this year. This is a great way to teach kids to give back. Thank you so much for sharing this! 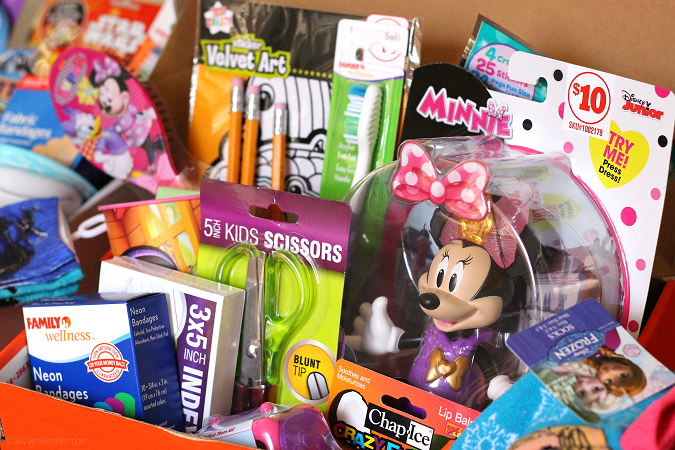 This is so important to do–we have our children pick out items for OCC shoe boxes every year. Definitely treat kids, especially kids in America compassion because sometimes there is a lot of entitlement. Glad you are teaching your kids correctly! This is a great way to tech kids about giving back! I have been looking for ideas since my son is starting to get older now. Thanks for sharing! My son helps out by working in various church’s soup kitchens. Serving those that’s a little less fortune. Helping at food pantry’s. I to love what you are teaching your kids to. Learning how to given no matter how big or small, or in what capacity is very important. We usually do a shoebox donation around school opening time. We fill ours with school supplies and donate them to our local public school. I think doing this during Christmas time is fantastic too. Let me organize something with my family and we’ll fill as much shoeboxes as we can. Our girls filled shoeboxes this year for OperagionnChristmas Child. We have been doing this for many years now through our church youth group. We are also helping purchase gifts for the giving tree at my daughter’s school. I hope they know how much this means to others and get joy from giving. I want my girls to be loving, thoughtful people.